Radio Ad Visit - Thank You! Thank you for visiting our website! Enjoy a free eBook. As a thank you for listening to our radio ad and visiting our website, we would like to offer you a free copy of our 12 Benefits of Incorporating an ESOP in Your Business Exit Strategy eBook. Click here to download. Click here to visit our News & Events page and listen to our ads. 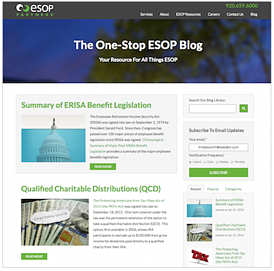 While we have your attention we'd like to encourage you to subscribe to our nationally recognized One-Stop ESOP Blog. Simply enter your email address in the subscription form included here and select your desired notification frequency.